Ahh, how I miss my Samsung i780. If you ask me, that was one of the better windows mobile handsets that Samsung has released. Too bad, they didn't feel the need to resurrect it with a part 2. They did come up with the Samsung B7320 and Samsung B7330 but though both handsets sport the Blackberry-like look, none of them have touchscreens. But what's Samsung's lost is Sony Ericsson's gain. The Japanese-Swedish company has recently introduced the Sony Ericsson Aspen. A Blackberry-like mobile phone that supports touchscreen and best of all, it's part of Sony's GreenHeart line, simply put, it's made from eco-friendly materials. 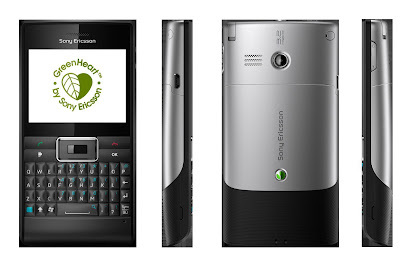 The Sony Ericsson Aspen has 2.4 inches resistive touchscreen (kinda small compared with the Samsung i780, 3G HSDPA/HSUPA, WiFi, Bluetooth with A2DP, and runs the latest version of Windows Mobile 6.5.3. In addition, it also supports Sony Ericsson's Xperia Panels which is probably similar to the Sony Ericsson Xperia X2. Other features include 3.2 megapixel camera, Stereo FM Radio with RDS, microSD slot, and a 3.5mm headset jack. There's no word as to when the Sony Ericsson Aspen will be available in the UK or its price. Any word as to when will this be available in the UK?